In this episode we travel to the Shiloh Christian Basketball Jamboree at the Bismarck Event Center. 16 girls teams and 16 boys teams made the journey in sub zero temperatures to enjoy 16 games of basketball indoors on Saturday January 13th. 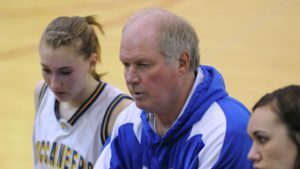 We meet 9 North Dakota basketball coaches and get their thoughts on dealing with parents, why free throws percentages seem to be dropping over the years, and many share their memories and thoughts of a North Dakota Basketball coach, the late Bob Waldal. Also we’ll bring you up to speed on the Glen Ullin / Hebron Lady Bearcats basketball season. This episode is made possible in part by The Dark Canoe Art Studio, run by Hebron, North Dakota artist Aron Anderson. Aron has won awards for his work including best of show and first place in the mixed media division at the 2017 Badlands art show, held annually in Dickinson, North Dakota. And by kristinjoydiede.com where the search for Kristin Joy Diede and Robert Michael Anderson continues. See sponsors for more info.